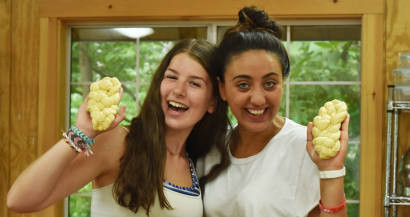 Berkshire Hills Culinary is a values based Jewish Camp that is welcoming to everybody. Our Culinary Curriculum covers many types of cuisine and includes familiar Jewish dishes like cheesecake and brisket along with less familiar dishes like Mofletta or Coriander Cumin Chicken. Campers will learn the cultural story of these foods while they cook. Jewish counselors and instructors from Israel and other countries will add to their understanding of Jewish life and food. All the food we serve and cook with is kosher, but you do not have to be kosher to enjoy it. Beyond the kitchen, at Berkshire Hills, we celebrate Shabbat with a beautiful dinner that includes singing, dancing and of course, homemade Challah. Tikkun Olam, the concept of repairing the world through community service, is an important element of the Berkshire Hills’ experience. 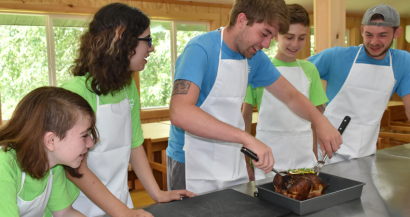 On Saturday morning, Culinary Campers will have the opportunity to put their skills to work with culinary projects geared toward the less fortunate with the goal of carrying this practice into their daily lives.